On July 29 at Gishippujima, Tokashiki Village, Shinzato pulls out fish caught in his net. 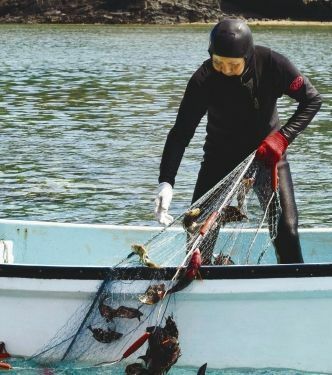 An eighty-year-old fisherman in Tokashiki Village has practiced skin-dive fishing on his home island for more than 50 years. 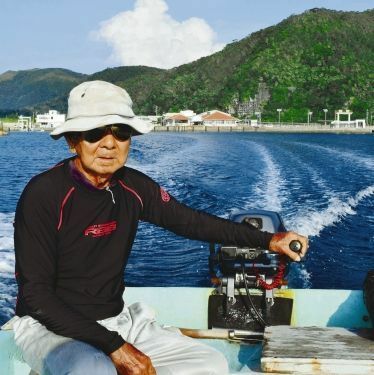 His name is Takemitsu Shinzato, a member of the Tokashiki Fisheries Cooperative, and he is known as a master of “homestretch” fishing, or Takemiiyachi. He continues to practice Okinawa’s traditional fishing on the island with a population of approximately 700 people. Shinzato grew up with the influence of late his father Takeharu, who was the shipmaster of a bonito fishing ship. Shinzato has been fishing as a hobby since he was 30 years old. After retiring from his job at the National Okinawa Youth House twenty years ago, he became a full-time fisherman. His catch is used for meals that his wife Katsuko serves at her restaurant. Shinzato owns one big sabani (Okinawan canoe) and a small boat. As he says, “It is only me who sets up the net for fishing.” He gets out on the boat, wears a wetsuit, a mask, fins, and weights. Then he dives to set up the net, directs fish into the net, and catches the fish. It is a physically and mentally demanding way to catch fish. Shinzato gets out for fishing on his favorite small boat. There are cracks everywhere at the bottom of the ocean, which is filled with coral reefs. Holding a 1.8-meter high, 30-meter long net, Shinzato dives to the bottom of the ocean. He stretches out and secures both ends of the net to coral. After putting weights on the net, the preparation is done. When the tide changes, fish gather in the deep cracks of coral reefs. Shinzato takes a deep breath in and dives to a depth of seven to eight meters below the surface of the sea. He quietly guides schools of fish such as Irabucha, Egwa, Kusuku, Katakashi, and then quickly pushes them into the net. Once he dives into the water, he does not take another breath for a couple of minutes until fish get caught in his net. He sets up a net six or seven times a day. Sometimes, the volume of landings exceeds 100 kilograms.